The sweet muffins are a healthier and lower-calorie version of classical desserts, such as cupcakes, creamy cakes and other pastries, which is why they will not affect your waistline. Plus they come in small sizes, so you will not be tempted to slice a huge piece and devour it. Last, but not least, they are ideal for disguising fruits and vegetables that your children do not want to eat as their delicious taste will conceal all traces of healthy ingredients. You will thus make sure your children eat enough fruits and vegetables by making them yummy healthy muffins. So, take out your aprons and muffin pans and let us embark on a journey to the delightful world of delicious homemade muffins! Preheat the oven to 180ºC and prepare the muffin pan. Mix the first three dry ingredients into a bowl. Mix the next six wet ingredients in another large bowl. Combine the dry and wet ingredients and stir lightly. Add the bacon, the shallots and the Cheddar. Spoon 3 tablespoons of the batter into 4 muffin cups. Slightly bang the muffin pan to even out the batter. 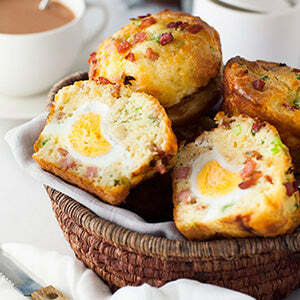 Make a hole in the batter of all the four muffins and crack an egg into each. Spoon the remaining batter on top to cover the eggs. Preheat the oven to 400°F and prepare tour muffin pan. In a large bowl, mix the flour, the sugar, the cinnamon, the nutmeg, the baking powder and the salt. In another bowl, combine the milk, the oil, the egg and the vanilla extract. Mix the wet mixture and the dry ingredients and stir just until combined. Scoop half of the batter evenly into the muffin cups. 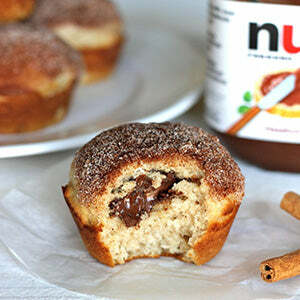 Then put a teaspoon of Nutella into the center of each cup and top with the remaining batter.